Im writing this report from my desk at home in Mountain View. Ive been home since Tuesday, June 29. There were several reasons for my coming home. Just before I left from home for Kennedy Meadows in mid-June, Rita and I received a letter from our landlord telling us that our house was to be sold and that our lease would not be renewed. Our lease expires at the end of September, exactly the same time as my projected completion of the PCT. Moving at the end of September would most probably necessitate my being home some weeks in advance to locate a new home, pack, and move. 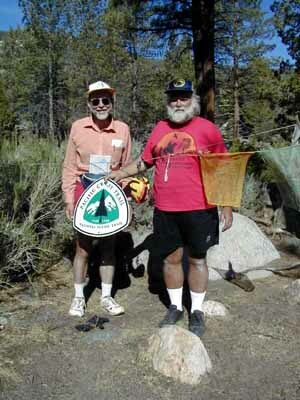 That would not leave sufficient time to complete the PCT this year. Ritas conversation with the landlord produced sympathy, but no extension of the lease. Rita and I needed to decide how to deal with that problem, and I wanted to do it in person rather than by telephone. Sunday afternoon as I hiked through Lyell Canyon headed for Tuolumne Meadows, I began to develop sore spots on the balls of my feet. Violating my own guidelines for preventing blisters, I continued to hike rather than stopping early and camping. 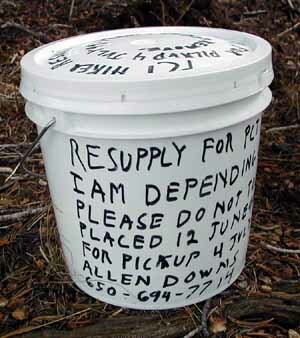 This was partly because I had been warned that Lyell Canyon was notoriously bad bear country - not a good place to camp, but mostly because I wanted to make it to civilization where I would find fresh food and a telephone. Although I did not end up with an obvious blister, the ball of my right foot was very sore, bringing back memories of the many uncomfortable miles I had hiked with blisters during the second week of my trip. I was very reluctant to set out from Tuolumne Meadows with a foot problem. I had found hiking the High Sierra in early season to be a lot less enjoyable than hiking the southern California portion had been, and there were a bunch of reasons. I was carrying a much heavier pack because I added a bear canister, an ice axe, a heavier sleeping bag, heavier rain gear, and a heavier pack to carry it all. I found myself constantly short of breath and uncomfortable when climbing due, I believe, to the combination of high elevation and heavy pack. My feet were almost constantly wet due to water on the trail, stream crossings, and snow. Then there were the mosquitoes. When I arrived at Tuolumne Meadows, the highest passes were behind me and I was expecting an easier time ahead, but was immediately confronted with horror stories about dangerously high streams and the trail lost under snow in the section from Tuolumne Meadows to Sonora Pass. Suddenly, the hike stopped looking like fun, and I was left to sort out my motivation for undertaking, and for continuing, the hike. 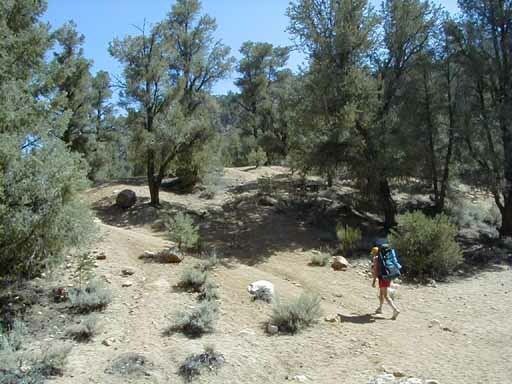 Im hiking the Pacific Crest Trail because I enjoy hiking and I wanted to take on an adventure and a challenge. But also Ive been telling myself, and lots of other people including everyone reading this journal, that Im going to hike from Mexico to Canada, and the completion of the hike has begun to take on the dimensions of an obligation. I knew before I started that there would be times when I was not enjoying myself, and that I would have to push on through those times, and so far I have. My last report, on Monday June 28 said that I planned to continue north the next day, but during the course of the day my motivation departed (temporarily, I assume), leaving me in Tuolumne Meadows with a strong desire to head home and not to head back into the mountains. The need to return home in early September to move seemed to me to make it almost impossible to complete the trail this year. Feeling it was no longer likely that I would reach my goal was a big disappointment, and a big part of my loss of motivation. I kept telling myself that I was doing this because I wanted to, and if I no longer wanted to, I would pause until my motivation returned. Ive been home about 10 days. I plan to return to the trail this Saturday, July 10, at Echo Summit - the point I was scheduled to reach about this time. This leaves a 160-mile hole from Tuolumne Meadows through Sonora Pass to Echo Summit which will have to be filled later if I am to complete the trail. I will return home again for another week in early August for Arunas wedding, and I expect to have completed most of California by that time. In the remaining 4 or 5 weeks prior to coming home to prepare to move, it would certainly be possible to complete Oregon, and it may be possible to find a way to complete the whole trail (for example, convince my landlord that I really need a two-month lease extension, but so far both Rita and I have been unsuccessful at this). I will head out this time with a lighter pack, as I dont expect to need the extra Sierra equipment for a while, and Im going to have to move pretty fast to even come close to completing the trail this year. Im looking forward to getting back on the trail and in the groove. 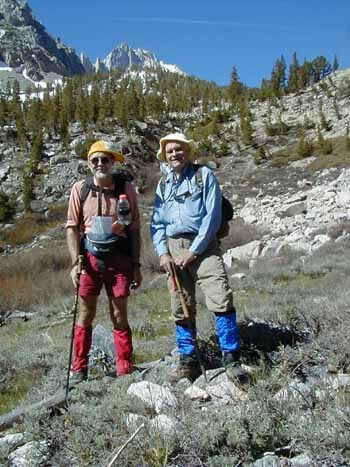 Dave Porter, the guy who suggested to Allen that he stow some food stashes along the trail between Kennedy Meadows and Tuolumne Meadows and then helped him put them in place, was kind enough to send me some pictures from the time they spent together doing all that. They're viewable below, as well as linked into the story back where they belong. 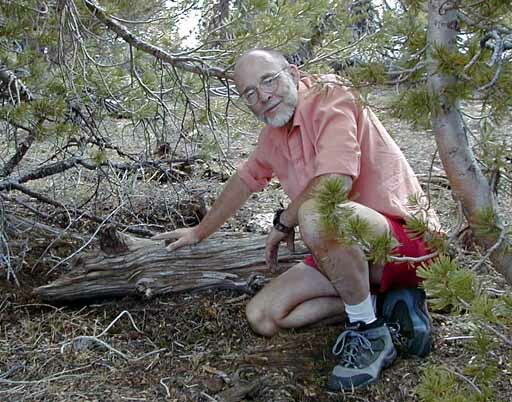 The last photo is a great one of Allen - maybe we'll use it for the cover of the book. He's even wearing his infamous leaky red shorts. the yard - it's full of Alfa Romeos. cars, and that's a full-time job. Dave likes for six months. 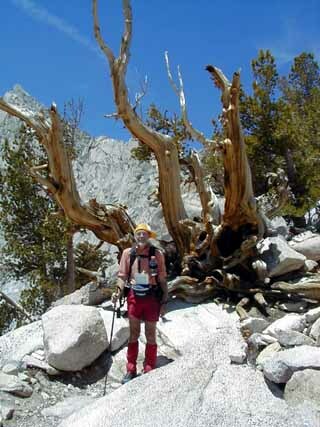 It's been mentioned that there's a bit of ambiguity with regard to the title of our saga, "The Great Allen Downs Pacific Crest Trail Adventure": Does the adjective "Great" apply to Allen Downs, or does it apply to the Adventure? Personally, I think it's a good deal of both.